Prop John Afoa made his All Blacks debut against Ireland in 2005 during their famous Grand Slam tour of the home unions, a feat that he would repeat in 2008. After breaking in to New Zealand rugby with Counties Manukau, Afoa switched to Auckland for Air New Zealand Cup action aged 18, representing the Blues in the Super 14. In 2006 he played every minute of the Blues' season before producing good form as the Junior All Blacks won the Pacific Nations Cup. He again represented the Junior All Blacks in 2007 before becoming a more regular fixture in the full All Blacks squad. Since then he has accrued 34 caps going into the 2011 World Cup though he has been largely used as a subsitute during this time with 27 of his appearances coming from the bench. 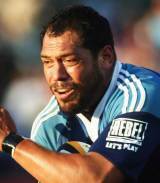 He appeared in four of New Zealand's 2011 Tri-Nations game and went to the World Cup with the All Blacks. After the tournament he joined RaboDirect PRO12 side Ulster on a two and a half year deal.